This warm, rich, spicy and camphoraceous scaent is distilled from the resin of the Middle Eastern shrub. Myrrh is antiseptic, antibacterial and antifungal, clears toxins and promotes tissue repair. It is extremely effective in healing wounds without scarring and infections in the mouth and gums. Properties : Tonic, sedative, kills germs, cell-rejuvenating. Blends well with : Lavender, Rose, Rosewood, Sandalwood. 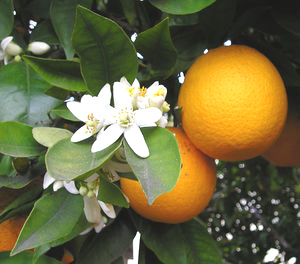 Neroli is distilled from fresh orange blossoms. Neroli is a harmonizing scent, both sensual and spiritual. It can use as an emotional first aid for shock, hysteria, depression, fear, anxiety and trauma. Whether diffused or used in massage, it will helo anger, frustration, hypertension, emotional tension and insomnia. Properties : Sedative, euphoric, anti-depressant. Blends well with : Bergamot, Jasmine, Geranium, Clary Sage. This sweet scent is always a favourite with childern and adults. It soothes irritability, moodiness and frustration. Orange oil is cold pressed from orange rinds. It is soothing to dry skin and can be used for acne. Properties : Uplifting, detoxifying, digestive. Blends well with : Bergamot, Lavender, Geranium, Ylang Ylang. The cool, clean smell of peppermint is distilled from the leaves and top of the herb which has been popular since the ancient Egyptians used it for digestive aids. Diffusing peppermint oil in the office can promote clear thinking, decision making and concentration. It can relive pain and congestion that causes sinus infections and migraines due to digestive problems. Properties : Anaesthetic, decongestant, digestive. Blends well with : Basil, Cedar, Cypress, Rosemary, Thyme, Pine.